Art: Rose, by Jessica Meyer, M4. 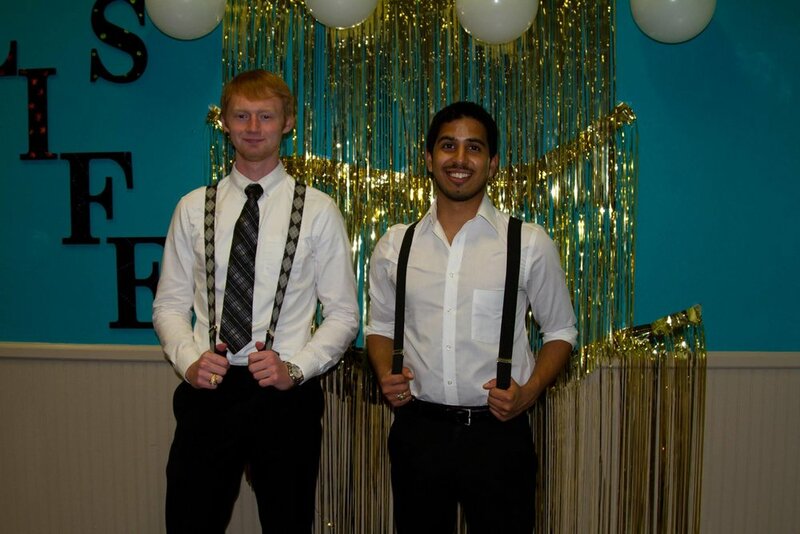 Andrew Sutter, M1 & Shiva Reddy, M1. Photo provided by Shiva Reddy. I am a huge believer in the butterfly effect—the idea that something small can cause massive changes later on. Whenever Andrew Sutter came to the Texas A&M Pre-Medical Society meetings, I always saw him as the quiet redhead who dressed really nicely. I would say “hi” and hand him a newsletter, and that was the extent of our interactions. Gradually, a fellow officer named Christina Rolandelli reached out to him. She made a point to talk to him at every single meeting and pushed him to come to events. Naturally, I got on board with this as well and started to talk to Andrew more. I wasn't at all surprised when Andrew ran for Christina's position as community service chair for the 2015-2016 academic year (our senior year). He ended up winning, and that is when our friendship truly started. Our new officer team was extremely close, and most of us would hang out almost every weekend in addition to attending society events. Andrew was always so excited about these and hosted quite frequently. He would always cook for us when we came over and was genuinely glad to do so. When I found out he was going to the same medical school as I would attend, I was ecstatic. Andrew’s presence made me less afraid to face this new world. There are too many memories I have of Andrew to write about in this short reflection. Some memories are fun—like his being a Gryffindor with me during my Harry Potter themed birthday party. Others are very personal and meaningful—like our huge heart-to-heart on a friend's balcony during my graduation party. However, nothing can be written to ever do Andrew justice. You simply had to get to know him to see what an excellent, kind, and caring person he was. I think about what would have happened if Christina had never reached out to Andrew during those meetings. He would have most likely still been a stranger to me—our interactions never moving past simple pleasantries. I am so thankful that this wasn't the case and that I was able to develop such a meaningful friendship. It was the butterfly effect in full force. Anita Mantri, M3. Photo provided by TAMHSC. In November of last year, Anita Mantri’s classmates and professors at the College of Medicine were devastated to receive the news that she had been involved in a car accident driving back to Houston in inclement weather. Her family flew down to see her in the hospital, while friends made plans to help her and the family in this time. On November 10, 2016, Anita Mantri passed away in the hospital, surrounded by her friends and family. I met Anita during my interview at the A&M College of Medicine. Anita stood out not only because of her bubbly personality but also because her excitement was contagious, and everybody wanted a share. She was ecstatic about her upcoming research projects, her upcoming clinical years in Houston, and life itself. Below are several remembrances from her friends and faculty in the MD/PhD program. Magic Realism, by Krystha Cantu, M4. On behalf of The Synapse Board, the MD/PhD students, and the College of Medicine, we offer Anita's friends and family our deepest condolences, for she is someone we will always hold dear in our hearts. Likewise, on behalf of the M1 class and all of Andrew Sutter's friends here at the College of Medicine, we would like to express our deepest sympathies for a friend and a wonderful colleague who we will forever miss. This past semester that we were able to spend with him (or more) will be among our cherished memories. I knew only one of the people in my anatomy tank group at the beginning of the school year, and it wasn’t Andrew Sutter. Virginia had paired us up to work together because she thought that he would need someone talkative. I am forever indebted to her—being in the same anatomy tank group gave me the opportunity to become friends with Andrew. Remembering Andrew in the cadaver lab, there were two traits of his that made me especially grateful to have him in our group. Andrew was engrossed by the anatomy we were exploring in the lab, and his joy of the experience was infectious. After several hours of trying to uncover minutiae hidden within a human body, many of us began watching the clock and wishing to simply be done with the day’s assignment. I certainly felt that way more than once. I cannot remember Andrew complaining, showing signs of impatience, fatigue, or frustration in lab. While other classes might have been stressful for Andrew, the anatomy lab was like playtime. Any lab in which we were able to go beyond the basic dissection tools and use a bone saw or other large surgical instrument, Andrew’s face would light up like a child’s on Christmas morning. I think it is natural to focus on what has been lost when a friend and colleague passes away. Those of us who knew Andrew will miss his sense of humor and adventure. The challenging years ahead will be a little bit harder without Andrew beside us. I am grateful for the short time I was able to spend with Andrew. As we were working together discovering the miracles of the human body, week after week, his passion for anatomy became evident. I think for Andrew, anatomy lab was one of the most exciting adventures of his first semester of medical school. His sudden passing reminded me to be thankful to have the opportunity to follow my passion for medicine, and to enjoy every day of it. "Cambiando mi lamento en baile"
Warm, caramel hands, an energetic "Hola!" Here we are, scrubs, stethoscopes, and all. Ready to meet, ready to "treat"
A somnolent, gaunt 6 year old girl; we ask "Donde te duele?" to point to her stomach. She says she cannot afford bottled water. We tell her, boiling the water is better than nothing. Having nothing takes on new meaning here. Multivitamins, anti-gripal, anti-parasites, anti-fungal, omeprazole refills, what more can we do? The younger two have fungi on their abdomen, elbows, and scalp; the older has white exudates on her tonsils. The oldest, 13 years old, smiles shyly and asks for another sticker. We can't do much, but I don't remember having felt such gratitude before. As if to dance with the swaying palm trees. It was the fifth day in a row of waking up at 4:30 in the morning sleepy and rushed, attempting to be on time for rounds. I hurriedly dressed and started a pot of coffee hoping to leave my apartment by 5:15 a.m. Alas, it was already 5:20 by the time I grabbed my bag, coffee, and white coat and jogged to my car. Angry at myself for not checking the weather before rushing out of my apartment, I suddenly realized I had forgotten my umbrella in the rush, leaving me with soggy scrubs for the better part of the morning. I pulled into my usual spot in the hospital parking garage and walked full speed toward the stairs. Preoccupied with the calendar on my phone, I hardly noticed the door slam into my face; a hospital cafeteria employee in front of me hadn’t seen me a few paces behind her. A quiet “sorry” echoed up the stairwell a flight or two below me. “It’s alright.” I really didn’t mind; we obviously were both a little behind schedule this morning. I looked out toward the hospital, only 50 yards away, quickly rummaging through my bag before getting ready to sprint for cover. “You comin’?” To my shock, the same cafe employee who had accidentally let the door slam in my face was waiting for me with an open umbrella. I heard myself stammer a surprised “Thank you” before the cafe employee raised her umbrella enough for me to join her under its cover for the walk across the street. We raced the distance under the relative dryness of the umbrella as I told her I was a medical student and we shared small talk despite our language barrier. She congratulated me and wished me luck as we parted ways at the hospital entrance. Maybe it’s time to walk around with our eyes up, taking time to notice the beautiful people who populate this vast, diverse, and intricate world. Once we take the time to notice those around us, it will become that much easier to show that we care, not only as future doctors, but as humans. I hope, by observing and caring for others, that we will notice the same in return—there are others who care about you. Taking a few minutes to look up from our preoccupations and interact with others will enrich our experiences with other points of view and cultures. On my elevator ride up to my patients’ rooms, warm and dry thanks to my umbrella acquaintance, I felt valued. It changed my outlook on the day—I went from being moody and depressed that I was coming to work late and soaking wet, to warm, dry, hopeful, and ready to pass on this small act of kindness. Andrew passed away on a Sunday evening and was laid to rest on the following Saturday in his hometown of Portland, Texas. My classmates, Dr. McCord, and I made it to the service which was held at the local junior high school. An auditorium, filled with loving family members and friends watched as the service opened with a film in honor of Andrew’s memory and the myriad of accomplishments he completed. Remarkable memories of Andrew came rushing back to each individual as they reflected on their special times with him. Our hearts, heavy with Andrew’s recent departure, not only dictated pain of loss, but also permitted us to remember Andrew through the funny and goofy stories told by the mentors and peers closest to him. The pastor led the congregation in scripture, prayer, singing, and praising in his memory. His loving parents wrote a letter to share their memory of Andrew, and it was read by friends and family, including Andrew’s sisters. Having two older brothers of my own, I couldn’t help but cry after his loved ones spoke of looking up to Andrew since they never had the complete opportunity to express their affection. You Are Loved, by Lauren Ehle, M2. After dismissal of the pallbearers and family, a procession was followed to the local cemetery. On a sunny, windy, and humbled day, Andrew was laid in his final resting place, surrounded by loved ones and those who held profound admiration for the man who would stay in their memories. Despite a difficult day, Andrew’s presence will be carried through the A&M College of Medicine Class of 2020. Life is unpredictable. No matter how stressed out we are as students about the next grade or even residency match, we must find life to be precious each day. The moments I shared with you, you were incredibly gentle-hearted and cared deeply for others. You had a wonderful smile which would affix to people. When the Texas A&M College of Medicine Class of 2020 graduates are on that stage, you walk with us. I am undeniably grateful to Andrew’s parents, Dr. David and Vivian Sutter, and Andrew's two younger sisters, Bethany and Cara, for allowing us to attend his funeral service. My thoughts and prayers go out to the Sutter family. The A&M College of Medicine family is with you. We will honor Andrew not only by giving our full support for the scholarship in his name, but also by carrying his memory with us in our future careers to help others. Texas A&M University students attending an on-campus protest on December 6, 2016. Photo by Cody Cobb, M3. Aggies United Counter-Protest - Kyle Stadium, December 6, 2016. Students, faculty, families sit in the bleachers and cheer at the diverse mix of groups presenting on stage. A South Asian a cappella group sings “Hallelujah,” a Mexican folklore dance ensemble performs “Ballet Folklorico Celestial,” faculty groups perform in their jazz trio and string quartet ensembles, the university’s chancellor and president speak, A&M’s quarterback Trevor Knight speaks. Actor Hill Harper emcees the event with the university’s student president, addressing the crowd of about two thousand. Rudder Plaza, December 6, 2016. Students and faculty stand together in silent protest, holding their signs, forming a community. Medical students stand in unity in their white coats. Three protests—all exercising our right as students to free speech. Texas A&M officially organized Aggies United—maybe they hoped it would draw attention away from the visiting speaker who instigated this protest, forcing students to defend unity and diversity. On December 6, Richard Spencer, a man notorious for his alt-right speeches and racist ideology, spoke on our main campus, at the invitation of a former student. When this invatation was announced by the individual who invited him, people were shocked, personally insulted, ashamed, and confused by his imminent presence on our campus. And so we spoke up. We spoke up, and we were persistent. The Aggies United event was created within less than a week, in response to the massive amount of dissent students expressed to our university’s president, Michael Young, over Richard Spencer's speaking at A&M. I had emailed President Young a long message, too, thinking it would go unheeded, feeling like I was wasting my time editing it and rereading it. It was probably one of the longest emails I’ve ever written. And in the end, after looking over it for another day, I almost scrapped it entirely. I don’t know why, still. I don’t know why I was so pessimistic about the potential outcome, when the first and only thing that matters in the moment is at least doing something, saying something. Texas A&M College of Medicine students and faculty attending on campus protest on Dec 6, 2016. Photo by Cody Cobb, M3. The students who protested, and President Young himself, made so many of us feel welcome at this school with their resounding negation of everything the speaker represented. I think in so many ways, great physicians are a successful combination of antithetical characteristics: idealism and realism. We as future physicians must be idealists and open our minds to utopian-like goals for patients, yet we must also be realists to precipitate results from these idealistic goals. Idealism just ends up as a silly pipe dream without the latter. Whether the realism in physicians means fighting for patients’ rights in a political context, teaching future physicians humanism in medicine, or standing silently at a demonstration against racist ideology is up to the individual themselves. Our many classmates at the demonstration on December 6th were signs of our potential. They were signs of tangible, realistic action that represented the ideals that all of us hold. Upon completing our first semester of medical school, our Aggie Class of 2020 lost a member of our family. Our pain and grief are made worse by the fact that Andrew had just started to follow his dreams and passion for medicine. For those who didn’t get the privilege to know Andrew personally, Andrew impacted those he knew through his kindness, love of life, friends, cooking, and spontaneity. The day after we were told of his sudden passing, several M1s and faculty members got together to share stories of how he impacted each of us. The meeting resulted in many hugs, much laughter, many tears, and this reflection. Andrew was a proud Aggie and shared his undergrad experience with several of our classmates. Shiva Reddy shared multiple stories about Andrew’s love of cooking for friends even after long days of classes and studying. His passion for spending time with friends and family was inspiring. Shiva also shared a recollection about a spontaneous nighttime road trip that Andrew spent rolling down the window and belting out rap songs. That was Andrew—focused on the journey and experience rather than the destination. Ryan Tacon remembered how Andrew had happily listened to his excited chit-chat during white coat ceremony. Even though Ryan felt he was talking too much, Andrew continued to patiently listen. Later, Ryan had the sad realization that, in four years, when it came time for graduation, there would be an empty seat next to him where his friend would have been. Mike Terry remembered how Andrew had come to give him a huge congratulatory hug when he was accepted to medical school despite being alumni a few years apart. Andrew’s passing hit me unexpectedly. Just as I was excitedly opening all my new medical equipment, I realized Andrew would have been doing the same thing. I will miss the few short hours I spent studying with him in anatomy lab as he shared his passion for teaching anatomy! We are all following our passions, and most days amidst late night studying and stressful exams, we don’t take the time to appreciate that we have the privilege of actually achieving our dreams. There are plans to create a lasting memorial for Andrew on behalf of the Class of 2020 and present it to his parents during or before Silver Taps in February 2017. While the grieving process will take a long time, Andrew's passing reminded us to cherish the small moments that we have and to take care of ourselves even as we immerse ourselves in studying or taking care of patients. With Andrew, it was always the little things. A smirk here, a witty quip there. He always had this way about him that put you at ease and made you feel welcome. He was also full of surprises. Upon meeting him during our junior year at Texas A&M, my first impression was that he was a typical pre-med student who only had time for school. I could not have been more wrong. He was an avid hiker. He conquered Black Diamond trails in both mountain biking and skiing almost every summer or winter break. He ran at least four miles every day and played basketball regularly. He had a passion for music, particularly rap music, which he would blare from his truck’s subwoofers. He loved collecting wood for campfires and cooking for his friends. He was always the first to lend a hand, and whenever he would do something for you he genuinely never expected anything in return. He was a man of integrity and was always looking forward to his next adventure. I truly count myself blessed to have gotten to know him like I did. Andrew gave me a love of hiking. He took me, Shiva, and our friend Whitney to Colorado during the summer, and among our many adventures, we tackled three hiking trails. Our second hike really stands out in my mind. It began with a beautiful scenic drive. Although at this point we had been in Colorado gawking at the mountains for several days, Andrew still took the time to take the scenic routes so we could enjoy them. He would patiently slow down, allowing us to take in the full breadth of each view that he had seen a hundred times. We soon reached the trails at Boreas Pass and hopped out of his black Suzuki truck. We ogled at the peculiar forgotten town that remained there before we began exploring the area. Of course, curious Andrew tested each door to the old buildings. He also climbed up on top of the abandoned train car and encouraged us to do the same. Then we turned our eyes to the mountains ahead of us. They looked easy enough to conquer, but that turned out to be extremely misleading. This was by far the toughest trail we hiked our entire trip. The uphill slant was so steep at times that it was easier to crawl on all fours than to walk upright! While Shiva, Whitney, and I struggled to take ten steps without gasping for air or stopping to appease our aching legs, Andrew was treating it like it was nothing. He would usually be thirty feet ahead of us, and I’m pretty sure he only stopped so we wouldn’t get lost along the way! When we finally reached the top, the sights were breathtaking. There were snow-covered mountains in every direction you looked. On one side there was a river that ran right in the middle of the valley. On the other there were rolling hills lined with beautiful, Christmas evergreen trees. Andrew and I thought it fitting to reward ourselves for conquering that hike by plopping down in this huge pile of snow. We sat there for nearly a half hour talking, laughing, and enjoying the view. He shared stories about the other times his family hiked that trail and how he used to bring his mountain bike up there and race back down at insane speeds. We talked about how moments and places like that made us feel so much closer to God. We threw snowballs at our friends Shiva and Whitney, and occasionally a rogue one would "accidentally" hit each other. We also closed our eyes for a bit, taking in the moment, not wanting the day to end. Eventually, however, hunger struck, and Andrew’s famous cheesy bread sounded all too good to pass up, so we decided to head back down. Not long after we began our descent, we came across a huge expanse of snow, and Andrew, always up for a challenge, decided to cross it instead of going around. A few steps in, we realized it was going to be more difficult than we originally supposed. So, what did Andrew do? He rolled down the mountain instead of walking! We all laughed so hard as he screamed until he reached the end of the snow. Then we tossed him our stuff, and we rolled down, too. I can still hear our laughs as they echoed off the mountains. This is one of the many memories I will treasure of my friend Andrew. I’ll see him again someday, but until then, I’ll continue having adventures in his honor because I know that is exactly what he would be doing. Andrew Sutter (M1) hiking. Photo provided by Shivanandan Reddy, M1.